Within three months of Britain’s declaration of war, Walter left his calling in the Lethbridge area and enlisted. He travelled to Regina and on October 23rd, signed up with the 28th Battalion (Northwest), one of the battalions that formed the Second Contingent of the CEF (Canadian Expeditionary Forces). He recorded on his attestation papers that he was a student and received the rank of private. As part of the Dominion, Canada was automatically at war when Britain declared war but Canada’s government was free to decide how many men to send overseas. The Prime Minister originally offered 25,000 men and ended up sending 30,000 + (making up the 1st Contingent) in October 1914. Formation of the second contingent was underway before the first had even made it to the shores of England. In the spring of 1915, the Second Contingent including Private Cripps and the 28th Battalion followed. Private W Cripps stands on the extreme right in the second row. I found a commemorative booklet of their whole Battalion on the Internet Archive – digitised and uploaded only 6 months ago. Walter likely joined as soon as possible because England was his homeland; perhaps he also thought he could serve God best among the troops in the battlefield. 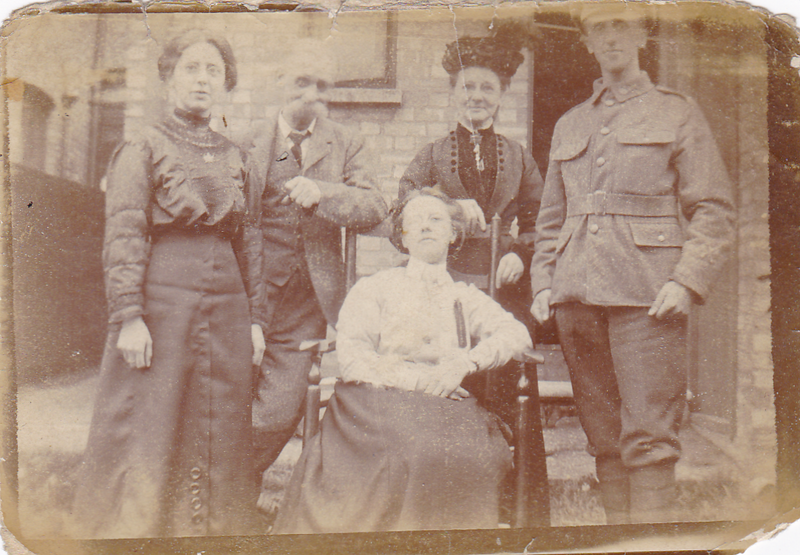 Written on the back: Mr & Mrs Cripps & family. Croydon, Surrey, England. Harold was not so quick to enlist. While many young Canadians rushed to enlist when war first broke out, it was interesting to find out that the majority of early enlistees were not Canadian-born. I wondered why that was (especially in comparison to Australia’s figures). It was good to step back and gain a wider picture of what was happening in Canada in this early phase of the war. In the summer of 1914, there were large numbers of single male immigrants in Canada, many of them from Britain. They came over looking for work/adventure, maybe with vague dreams of settling. But times were tough; there was a depression on, and a long cold winter was only months away. For many of these young Brits, enlisting must have looked like a paying job and a ticket home – at least for a visit. Walter’s Regimental number was 73645. I spent some time last year looking through the attestation numbers to see if any of the other clergy from Lethbridge had joined with him. None of the names or details matched. But I did find someone familiar. Also enrolled on the day into the 28th Battalion was Private #73634 James Allen, my great uncle from England (Edith’s brother). He had received a scholarship to study theology at St Chad’s in Regina in 1912. So it was he that Walter had come to enlist with (October 23, 1914). I went back to the photos my mother’s cousin shared with us some time ago. Her father, Jim is sitting on the steps of St Chad’s. And there is Walter sitting right next to him, his elbow slung over his mate’s knee. Jim Allen (right) and Walter Cripps (centre) plus others on the steps of St Chad’s after enlisting in the 28th Battalion. I still don’t know how Walter and the Allens knew each other, but the evidence is strong that there was some connection via theological study. Walter did not become a minister until the war was over (1920 in Canada) and family stories say that James abandoned his religious convictions during the War. We have many pieces of memorabilia from Durham Cathedral and I now wonder if there was a St Chads, Regina connection with Durham and the theological colleges there (including a St Chad’s). This entry was posted in Becoming soldiers, Historical Perspective and tagged 1914, 1915, 28th Battalion, Canada, CEF, enlistment, Regina, WWI on September 6, 2015 by Catherine Hainstock. Hi Catherine, what was your grandfathers middle name? Nice to hear from you, hope you are well. My grandfather’s full name was William Harold, but because his father was also William, they called him by his second name. It seems to be a bit of a tradition in the family now that I think about it – my brother used his middle name and we’ve done the same with our oldest.